Auditor General Gamini Wijesinghe called on the Mahanayake’s of the Malwathu and Asgiri Chapters and commented on the proposed Audit bill which will be debated in Parliament on the 05th of July. The Auditor General called on the Mahanayake of the Asgiri Chapter of the Siam Sect the Most Venerable Warakagoda Sri Gnanarathana Thero. The Auditor General noted that the legislation would affect wrongdoers and that there are plenty of wrongdoers who are attempting to influence this legislation. The Chief Plate of the Asgiri Chapter noted that he will call on all Parliamentarians and Ministers to pass this bill immediately because the country is aware of the dark situation that has afflicted the country’s finances. Thereafter the Auditor General called on the Mahanayake of the Malwathu Chapter of the Siam Sect the most venerable Thibbatuwawe Sri Sumangala Thero. Gamini Wijeysinghe explained to the Chief Incumbent that there is strong opposition against this legislation from public officials. 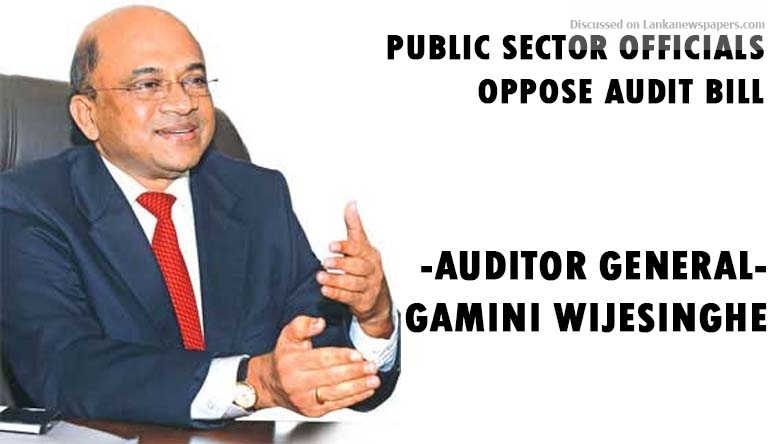 Since 2003, the audit bill has been subject to a number of changes and it was first proposed to vest the power of supervising all departments and corporations with the Auditor General. Yet, the draft bill put forward now weakens that power. Through this draft bill it has been proposed to empower the Ministry Secretary to impose a surcharge of Public Servants guilty of committing acts of wrong, this power was initially vested with the Auditor General. It has been proposed to remove the power given to the Audit Commission on taking up appeals after imposing a surcharge, to a separate committee. When questioned about the Hambantota port and the possibility of an investigation by the Auditor General’s department, Wijeysiri noted that the Hambantota Port is a special project and that it does not come under his purview. He noted that he could do so if a special request is made by Parliament.